AccuWeather Global Weather Center - September 11, 2018 - With Hurricane Florence intensifying, South Carolina has ordered mandatory evacuations for about 1 million people along the state's entire 187-mile coastline beginning Tuesday. States of emergency have been declared in North Carolina, South Carolina and Virginia, but the impact of the storm has the potential to reach much further. AccuWeather-the world's largest, fastest-growing and most trusted provider of weather forecasts and warnings-wants people to be "AccuWeather Ready" for whatever Florence brings. Downloading the free AccuWeather app will help people to stay up-to-date with Florence's expected track and impacts to the U.S. In addition, the AccuWeather Ready site at http://accuweather.com/ready offers a wealth of information and useful content to help people prepare for the storm, including safety tips and resources, personalized weather preparedness plans, detailed checklists, educational weather news and videos, facts about potential health impacts, and more. "Residents and interests living along and near the Carolina coast and even up toward the Virginia Capes should closely monitor Florence and be ready to put their hurricane plan in place," Kottlowski said. "If you do not have a hurricane plan in place, do so immediately." An extensive hurricane preparation checklist to help keep people safe and out of harm's way and to protect property. A detailed checklist on ways to help people affected by hurricanes. An infographic on recovering from a hurricane. Information about the psychological impact of disasters such as hurricanes. Facts about tropical storms, hurricanes, and their risks. A fact sheet on tropical storms and checklists to help you prepare for them. By providing forecasts and warnings with an unchallenged and verified margin of Superior Accuracy™, AccuWeather helps save more lives, keeps more people safe, and helps people and companies plan more effectively for all types of hazardous weather-including hurricanes, tropical storms, excessive heat and humidity, lightning, heavy rains and wind, lightning, flooding and tornadoes. The AccuWeather Ready initiative was designed to take this commitment even further by providing weather preparedness updates and tools when they matter the most, personalizing the weather so people can improve their lives. AccuWeather's proven Superior Accuracy is trusted by 245 of the Fortune 500 companies it serves as well as thousands of other businesses and government agencies around the world. In the most comprehensive study of forecast accuracy ever undertaken, AccuWeather was overwhelmingly reconfirmed by independent industry tracker ForecastWatch as the world's most accurate source of weather forecasts in the categories of precipitation, wind, and high-temperature forecasts. In the study, AccuWeather's probability of precipitation forecasts, which are key to MinuteCast forecasts, were 21% more accurate than those of the next-ranked provider and 23% more accurate than the average of all other sources in the study. Further proving the reliability and consistency of AccuWeather forecasts, ForecastWatch found AccuWeather was the clear winner in wind speed forecast accuracy, proving to be 33% more accurate than the nearest provider of weather forecasts and 41% more accurate than the average of all other sources examined. 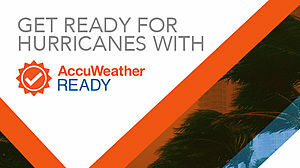 The AccuWeather Ready program demonstrates AccuWeather's continued leadership as a U.S. National Oceanic and Atmospheric Administration (NOAA) Weather-Ready Nation Ambassador. NOAA named AccuWeather as one of its first Ambassadors in the weather enterprise initiative, launched in 2014 to recognize organizations committed to helping the nation be better prepared for, respond to, and recover from weather-related disasters. AccuWeather and NOAA have been partners for many years. The company has supported NOAA and National Weather Service (NWS) budgets in testimony and presentations before the United States Congress and with the Office of Management and Budget, as well as other federal agencies. AccuWeather has been a longtime cooperation partner with NOAA.